In reading, third graders focus on expanding skills that “good readers” develop to better understand and think about what they are reading. They are taught to make text-self, text-text, and text-world connections while they read. In the following unit, students learn about character development through the theme of friendship, focusing on the strategy of visualizing to create mental images while reading. Third graders also focus on asking questions while reading texts with the theme of prejudice. Students work on summarizing skills while reading The Courage of Sarah Noble by Alice Dalgliesh. Students learn what makes a book historical fiction. In the last units of the year, students take all of the reading skills they’ve learned throughout the year and use them to run literature groups. In these groups, students independently discuss what they read, modeled after an adult book club. The third grade writing curriculum is based on the 6 + 1 Traits of Writing program. This approach teaches students to focus on the traits of: ideas, organization, voice, word choice, sentence fluency, conventions, and presentation to improve their narrative and creative writing. Third grade students also learn how to write paragraphs to answer questions using reasons and details to support their answers. Students learn how to organize their ideas in a graphic organizer before starting their writing to help them have a more organized, thought out piece of writing. Grammar is taught using the Framing Your Thoughts program in which students learn to identify parts of speech and the structure of a sentence. Spelling units are individually assigned from the Sitton Spelling and Word Skills Program. Third grade math is taught using the ThinkMath! program. Initially, third graders focus on the basic operations: addition, subtraction, multiplication, and an introduction to division. They then learn different strategies to understand and solve problems using these operations. Time is spent focusing on place value and regrouping to better understand how to write numbers and perform calculations. During the year, as students become more fluent with their computation facts, they learn to define patterns through multiple units as well as increase skills related to graphing and fractions. Students complete a geometry unit, in which they examine two and three-dimensional figures. In addition, students identify different attributes to describe a 2-dimensional shape, such as numbers of sides, number of pairs of parallel sides, the size of a figure’s angles and the symmetry of a figure. Students also identify different attributes to describe 3-dimensional figures, such as faces, edges, and vertices. Finally, third graders practice measuring length, area, and volume and using appropriate corresponding units of measure. In third grade, students learn how to track their predictions, observations, data, conclusions, and learning in a science notebook. The first science unit focuses on the science of sound. Students explore how sounds are made, how the characteristics of an object can affect the sound made, and how they can then change the sound of an object. Students then learn how the ear works, which connects to learning about deafness. The next science unit in third grade focuses on light during winter, the darkest time of the year. They explore characteristics of light, learning about how light, as energy, interacts with objects. Subsequently, they learn about the different parts of the eye which leads to learning about blindness. This unit is taught in conjunction with Chanukah, the Jewish festival of lights. Students interpret different Jewish texts that mention light. Next, students explore the properties of water and study the water cycle. Students consider ways in which people can conserve water while learning about how water is cleaned. In our ocean unit, students explore oceans as ever moving and changing bodies of diverse life that are made of different biomes and structures. Students look at what defines different zones in the ocean. During this unit, students also learn how to create their own educational videos to teach others about the ocean. In the last science unit, students learn about whales. Students look at what makes these marine mammals unique inhabitants of the ocean and which adaptations they have developed to help them survive. Third grade students are immersed in a completely Hebrew speaking environment. They learn directions and basic needs for everyday life which enables them to express themselves more comfortably in Hebrew. The Tal Am program is the foundation for Hebrew instruction. The first unit covers the classroom and school environment. Students learn verbs and vocabulary associated with their school day. Next, students learn about their home environment including clothing for all seasons, household items and appropriate verbs. Students also focus on food and nutrition; they learn how to categorize different items of food and how to create a balanced meal using Hebrew vocabulary. Additionally, Israeli childhood songs are introduced as a vehicle for teaching new vocabulary and Israeli culture. Torah is taught using the MaTok curriculum which examines Torah in Hebrew verses. Students learn to find meaning in the text with the goal of becoming comfortable with biblical Hebrew. Students learn how to identify characters in the text, roots of words, repetition of words, nicknames, places, and conversations. 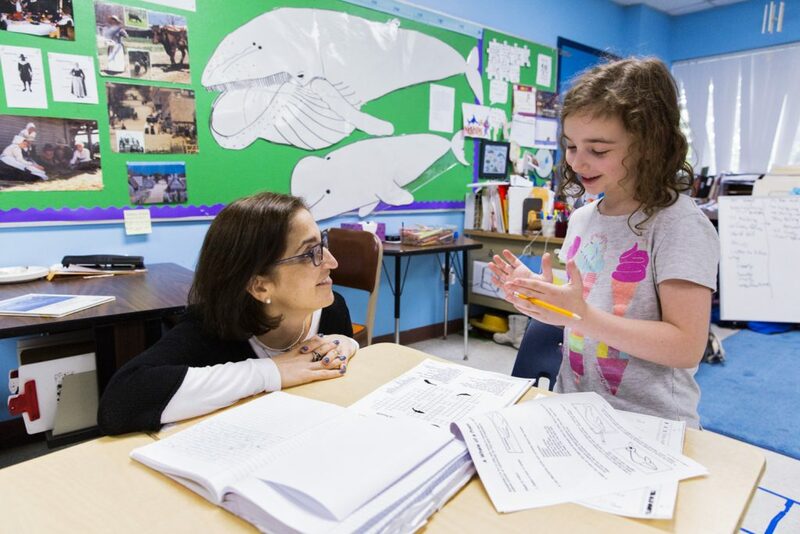 Using these skills, students are able to make connections to modern Hebrew and get the main idea from the text. Some deeper conversations are conducted in English, but students are able to discuss the text in Hebrew, as well. Through the parashot Lech Lecha, Vayera, and Toldot, students explore and discuss the following themes: brit (covenant) and peoplehood, welcoming guests, family relationships, and the struggle between good and evil. Students experience community tefila twice a week with the school rabbi and rosh ruach (song leader). Music is used to enhance students’ spiritual experience connecting their hearts and minds. Students learn the keva (structure) of the Shacharit (morning prayer service) and explore pathways to deepen kavana (intentionality). Students also participate in a Torah service and discuss the weekly reading as well as other sacred texts. Students explore neighboring synagogues to experience prayers in different settings. As the school year progresses, students learn about the Jewish holidays in Hebrew through discussion and reading Hebrew stories.. They examine different customs and traditions associated with each holiday and continue practicing the corresponding blessings. Students compare and contrast how holidays are celebrated in America and in Israel. The goal of our music program is for students to become skillful and enthusiastic music makers, encouraging music literacy, participation and performance. Through joyful discovery of classical and contemporary music, students cultivate musicality and knowledge. Third graders continue working on singing in-tune with expression and confidence while gaining confidence on stage. Third graders continue to learn to read music and play recorders. Music is integrated across the curriculum as students sing and perform to enhance understanding of subjects from social studies to Judaics. Students work with a variety of drawing tools, paints, and papers. Students learn techniques for drawing, painting, weaving, printmaking, and collage. Third graders continue learning their elements of art such as line, shape, color, and texture. Emphasis is put on the creative process rather than the finished product. Art history is an important component of the curriculum. Throughout the year, art is integrated with units of study in the classroom which helps children visually understand subjects/content more clearly. Third graders begin the year discussing emotions and how they apply to different characters. Students break down stories and then act them out, working in teams. Students continue learning about stage mechanics and demonstrate their ability to work with a director by rehearsing and performing a short play. In third grade students create a play from scratch, working in groups to brainstorm, outline, write, and perform their own work. In third grade physical education, students participate in low and high energy activities. By developing physical coordination, sportsmanship and problem solving, students learn through teaching fundamentals and rules of major sports, as well as physical fitness, stretching, and agility. Units over the school year include soccer, flag football, basketball, handball, strategy games, and floor hockey. Through the incorporation of skills, age appropriate rules, and scrimmages, students learn new sports by developing their physical fitness, playing respectfully with peers and engaging in healthy competition.